Would ya take a look at this…? Yup, I’m at it again! Only this time, I’ve got the colour purple juuuuust right. In fact, it was finding the correct colour purple, at the Knitting & Stitching show at the RDS, that started my down this road – yet again. They say, third time’s a charm. They also say that the definition of madness is to do the same thing repeatedly – in the same way – while expecting a different outcome. 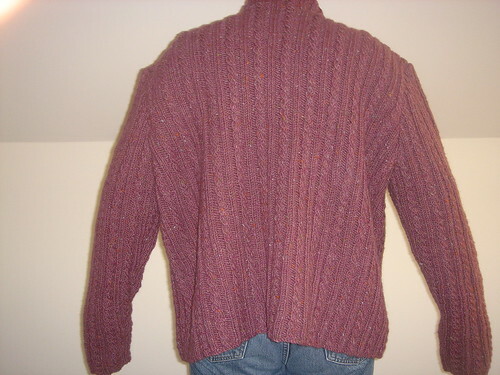 First there was the original pattern – Glenvar by Debbie Bliss which looks like this. Then we had the drive to Rip One / Knit One – and GlenvAaaargh!!! came into being. Unfortunately this – by a quirk of gauge (a.k.a. a learning experience) – turned out to be of Petite proportions. You can see from the picture, as it lies alongside the left front of The Behemoth. I thought I had learned everything there was to learn with GlenvAaargh!!!. Did you know that the gauge of knitted items, which have been sitting around and relaxing for a while, is markedly different from what you’ll produce with the same yarn and same needles after it’s been frogged? I do – now! I was willing to overlook the fact that GlenvAaaargh!!! only fit DH – at a stretch. I even worked in an extra two inches along the button band. I did this very cleverly too: vertically, row-by-row, in pattern. Elizabeth would have been proud. She might even have apreciated my wish to overlook the small question of completely forgetting to create a neckline! At all costs, even to dignity itself, I was not willing to admit defeat. That is, until I encountered the right colour purple. 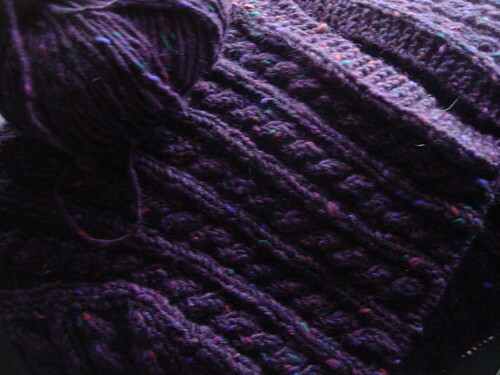 Very quickly – in the time it takes to whip out your wallet and buy 30 more balls of yarn – I decided to give it another go. I also decided that GlenvAaaargh!!! will be mine; afterall, it fits me! 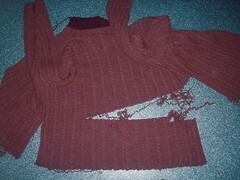 I decided that a different neckline – something more crew-neck – will be fine. Most of all, I decided GlenvAaargh!!! will not be frogged – that much is certain. 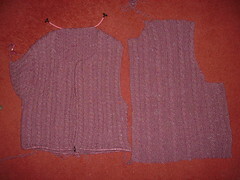 I worked out the pattern repeats so no fancy cabling is needed underarm. 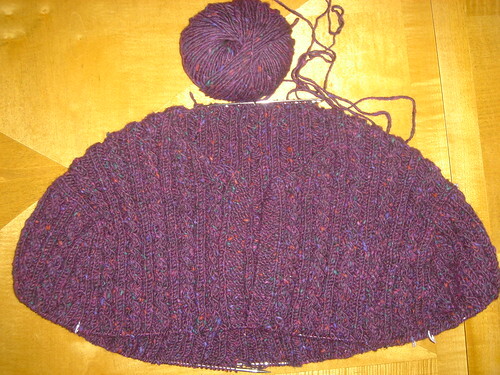 I can’t believe how fast this is knitting up… er… down. The best thing about this method is that all the fun and interesting stuff happens at the beginning: first the short-row shapings for the sholders (try saying that quickly! ); then increasing for the neck soon afterwards; and then – since I’m trying the version with the Simultaneous Set-in Sleeves – the increases for the sleeves start soon after that. None of these “events” take too long and there’s nice intervals of following the pattern straight for a while. I’m nearly at the point where I separate the sleeves from the body. At that point, all the hard work of figuring things out is over and it should be a straight-forward, enjoyable knit – all the way to the end. So, am I’m a sucker for punishment or am I tenacious? If it fits DH, then all of the trials and tribulations – and all of my perseverence – has been worth it. If it doesn’t… let’s just not go there!